The horse photographs of Eadweard J. Muybridge have been brought to life in tattoos and even knitwear. Now, his iconic images of a galloping horse have been immortalized in a quilt. Muybridge carried out his ground-breaking working in 1878 and managed to settle the contentious question of whether galloping horses lifted all four of their hooves off the ground at the same time. Now, a multi-talented team has incorporated Muybridge’s images into a quilt, with each panel representing one of the series of photographs he captured to prove that horses did, indeed, have all four feet off the ground when at full flight. Animator Nina Paley came up with the concept for the quilt and the design. She collaborated with Chris Carlson, who came with the Algorithmic quilt fill patterns, while Theodore Gray looked after the stitch-coding and binding. The stitching was done on a Quilt Master IV full-frame quilting system, capable of up to 1500 stitches a minute. The machine in question, named Behemoth, is operated by PaleGray Labs. The project team created an animated sequence of the actual panels to prove that Muybridge’s work has been faithfully recreated in the quilt. The quilt is available from Gray’s store for $US750. It comprises of 12 frames of Eadweard Muybridge’s 1878 photographic study. The high-loft quilt is 94 inches square, and is said to be suitable for display on a wall or for use on a queen or king-sized bed. One of the 12 quilt panels. Each horse is rendered with a batik fabric thorough a reverse appliqué process. 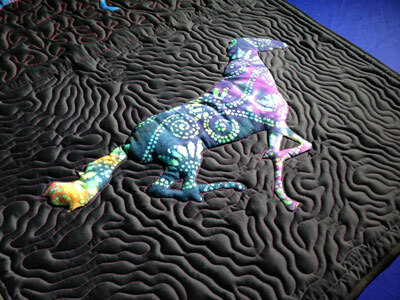 The quilt is stitched with individual layers of batik for each horse, covered by a layer of black fabric over everything. After the stitching is complete the black fabric covering the area of each horse is cut away, revealing the batik underneath. The thread color of the pattern surrounding each horse beautifully reflects the unique colors in each horse. Muybridge was born on April 9, 1830, in England, but moved to the United States at 25. He extensively photographed the West, but it was his work in recording animal locomotion that earned him the most fame. For the task, he invented a device called the zoopraxiscope to display moving pictures. His most famous effort came about in an effort to resolve an argument. In 1872, former California governor Leland Stanford, a businessman and racehorse owner, had weighed in on a popular debate of the time – whether all four of a horse’s hooves were off the ground at the same time during the trot. Similar questions were posed over the gallop. Until this time, most artists painted horses at a trot with one foot always on the ground. Their depictions of the full gallop often showed the front legs extended evenly forward and the hind legs extended to the rear – a position that defied even the most casual of observations. Stanford sided with the assertion of “unsupported transit” in the trot and gallop, and hired Muybridge to settle the question. In 1877, Muybridge settled Stanford’s question with a single photographic negative showing his standardbred Occident airborne at the trot. The negative was subsequently lost, but the image survives through woodcuts of the era. Spurred on by Stanford to expand the experiment, Muybridge had successfully photographed a horse at a trot much more extensively by the following year, and lantern slides of this work have survived. For the most challenging of the analyses, at a gallop, Muybridge set up operations at Stanford’s Palo Alto Stock Farm in July 1878. He placed numerous glass-plate cameras in a line along the side of the track, each triggered with a thread the horse had to run through. In later studies he used a clockwork device to set off the shutters in sequence as the horse galloped past. The image silhouettes were transferred on to a disc to be viewed in his zoopraxiscope. The body of work became known as “The Horse in Motion” or “Sallie Gardner at a Gallop”, and it proved conclusively that at one point all four hooves were off the ground. However, the four hooves were off the ground when the horse had its legs tucked under itself, not at full stretch. A study of “The Horse in Motion” was published in 1882, written by Dr J.B.D. Stillman. Although Muybridge’s images were used extensively in the work, he received no major credit. Muybridge often travelled back to England to publicize his work. He returned to his native England for good in 1894. He died on May 8, 1904, in Kingston upon Thames while living at the home of his cousin, Catherine Smith. Eadweard Muybridge’s famous “Horse in Motion” marked the beginning of high-speed photography.